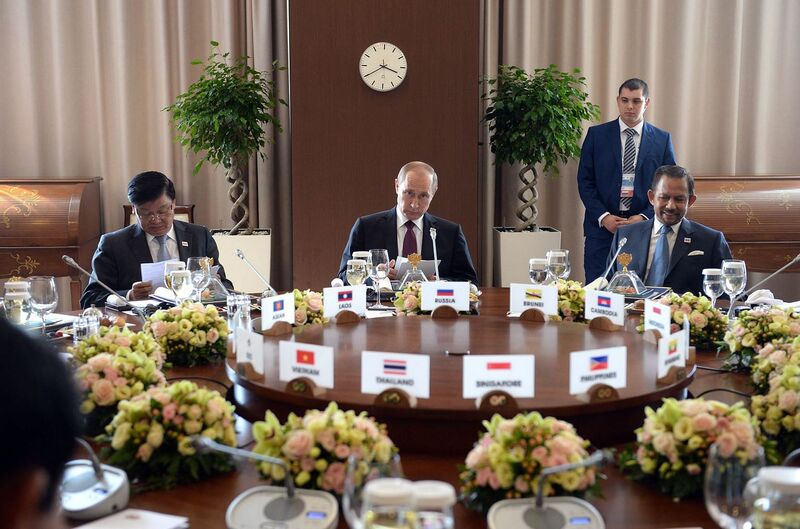 On May 19 and 20, President Vladimir Putin and the leaders of the 10 Asean members met in the Black Sea resort of Sochi to take stock of 20 years of dialogue relations. At the summit, they also unveiled a blueprint to strengthen and deepen ties over the next five years, and held a series of bilateral meetings. So are Russia and Asean on the threshold of a new, more substantive and comprehensive relationship? Maybe, but it will take time and effort, especially by Russia. On balance, Moscow needs South-east Asia more than the region needs Russia. As a result of Western sanctions imposed following the Ukraine crisis in 2014, plunging oil prices and structural problems, Russia's economy is currently in the doldrums. By tapping into South-east Asia's vibrant market of 600 million people, as well as the economic powerhouses of North-east Asia, Russia hopes to be able to ride out the economic storm. Closer relations with the Asean states would also lower the risks of Russia becoming dependent on China, and show the West that it is a Great Power that should be taken seriously. But this is not to say that Russia is unimportant to South-east Asia. Asean wants all the major powers to play an active role in the region's security affairs lest one country becomes dominant. Over half of Asean's members have bought arms from Russia's revitalised defence industry and sought its expertise in the energy sector. Vietnam is the exemplar par excellence. Vietnam's armed forces are equipped predominantly with Russian weaponry, including frigates, fighter jets, missiles and submarines. Russia is also building the country's first nuclear power plant. But after two decades, the relationship has failed to achieve even a fraction of its full potential. Because of this, Asean demurely refused Moscow's request to upgrade their relationship from partnership to strategic partner (the status of America, China and Japan) until Russia ups its game in South-east Asia. Such are the conditions clearly set out in the Sochi Declaration, as well as the action plan that Asean and Russia issued at the summit. As a result of Western sanctions imposed following the Ukraine crisis in 2014, plunging oil prices, and structural problems, Russia's economy is currently in the doldrums. By tapping into South-east Asia's vibrant market of 600 million people, as well as the economic powerhouses of North-east Asia, Russia hopes to be able to ride out the economic storm. In the realm of politics and security, the two sides pledged to step up cooperation in the fight against international terrorism and transnational crime. The provisions on the South China Sea dispute are set at the lowest common denominator, with calls for all parties to adhere to international law and an early conclusion to the Code of Conduct. There was also a commitment to strengthen the East Asia Summit (EAS) as the region's principal leaders' summit. Although Russia has been a member of the EAS since 2011, Mr Putin has never attended. The summit raised the bar for expectations of the Russian leader's participation in the EAS, so in September this year, we will see if Russia will walk the walk after talking the talk in Sochi. Trade between Russia and Asean is anaemic: only US$22.5 billion (S$31 billion) in 2014, compared to US$366.5 billion with China and US$229 billion with Japan. Both sides have agreed to substantially increase the value of two-way trade by 2020. Vietnam and Thailand have both set a target of US$10 billion in annual trade within five years, up from the current US$4 billion with Vietnam and US$2 billion with Thailand. In Sochi, Mr Putin proposed a free trade agreement (FTA) between Asean and the Eurasian Economic Union (EEU), an economic forum of five former Soviet republics, including Russia, as well as greater economic cooperation among Asean, the EEU and the Shanghai Cooperation Organisation (which includes both Russia and China). Asean agreed to examine the proposal. Singapore showed the greatest enthusiasm for boosting trade with the EEU. During his four-day trip, Prime Minister Lee Hsien Loong noted that, notwithstanding Russia's current economic woes, the medium to long-term prospects were good. Mr Lee said he hoped Singapore and the EEU could sign an FTA in 2018 when the city-state and Russia celebrate 50 years of diplomatic relations. So far, only Vietnam has signed an FTA with the EEU. In the realm of sociocultural affairs, the third pillar of the Asean Community, 2016 is the Asean-Russia Year of Culture. This initiative is designed to strengthen people-to-people contacts, as one can argue that currently, such contacts are perhaps the weakest component of the Asean-Russia partnership. Awareness about Asean issues and events is very low in Russia, and the recent summit was the strongest push in a decade to improve the situation. The summit was perhaps not a breakthrough, but delivered the desired results. Russia managed to host a large international event on its soil, thus countering the Western narrative that Russia is isolated, reaffirmed its interest in South-east Asian affairs and demonstrated the diversity of its Asian pivot ahead of Mr Putin's visit to China next month. For Asean, it was a good opportunity to showcase the organisation's centrality in the regional security architecture and ambitions to develop relations with an aspiring global power such as Russia. Ian Storey is Senior Fellow at the Iseas-Yusof Ishak Institute, Singapore. Anton Tsvetov specialises in South-east Asia at the Russian International Affairs Council, Moscow.